In a series of brief chapters, Al Gini lays out ideas for 'stepping out of the shadow of the self' - an argument for stopping thinking of yourself as the centre of the universe. It's hard to be good, he explains, until we realize that being good only has meaning in relation to other people. Ideas of justice, fairness, and ethical behavior are just that - abstract ideas - until they are put into action with regard to people outside ourselves. We may worry too much about good versus evil - big concepts that give us plenty of room to sit on the right side of the equation, he argues. Instead, we need to be thinking about how being good involves an active relationship toward others. Being good all by yourself may not be good enough. 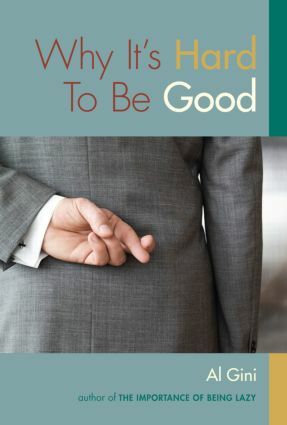 This warm and generous book is for anyone who wants to know how to use ethical thinking as way to live, work, and be with others.